“Girl With Death Mask (She Plays Alone)” / "Mother"
If last week’s episode was the sadness, then this one was the chaos that fills up the emptiness that inevitably follows the sadness. Angelo’s sudden death was like a shock to Switched At Birth’s system, but the show has no interest in wallowing in the sorrow that immediately follows a shock like this. It’s much more interested in what happens after that shock wears off and you have to move on with your life. As Daphne sadly intones to Bay, “life goes on,” no matter if you want it to or not. The entire Kennish/Vasquez clan is reeling in the aftermath, but it’s Bay and Daphne’s journeys that stand out the most here, if only in their stark contrast. Daphne is like an internal combustion engine of anger at this point, bottling up all of her rage and focusing it like a laser beam right at Regina, who she blames for Angelo’s death. Her efforts to be “normal” while the anger is eating her up inside lead to some ridiculously self-destructive behavior, in the form of cocaine snorting and throwing furniture off a college dorm roof (while ostensibly on a tour of Northwestern’s pre-med program). It’s tremendously over the top and more than a little bit forced, but it at least comes from a recognizable emotional place to ground the afterschool special feel of it all. Bay, on the other hand, is more interested in seeking out a connection to Angelo through his extended family. She ends up meeting Angelo’s cousin—who is a fairly awful guy—in a plot that’s far less about meeting Angelo’s cousin and far more about finding out that aneurysms run in Angelo’s family, as his sister also died from one. It’s like giving Bay the keys she needs to somehow help Daphne get over her rage, while also giving her a tangible (and perhaps even physical, if she has an aneurysm as well) connection to Angelo now that he’s gone. To watch Bay make a real connection with Angelo’s family through her sister Abby was like showing the two sides of Angelo himself through the two family members Bay meets here; his Sorrento side might have caused problems sometimes (like his cousin did here) but it also was capable of great love, and Abby is the purest example of this love. Beyond Bay and Daphne, the rest of “Girl With Death Mask” is scattered, which makes for a bit of a shaggy mess—but not in an unlikeable way. It’s just hard to get invested in Kathryn’s disastrous attempts to set up Abby’s father Leo and Renzo when Angelo was just removed from life support. 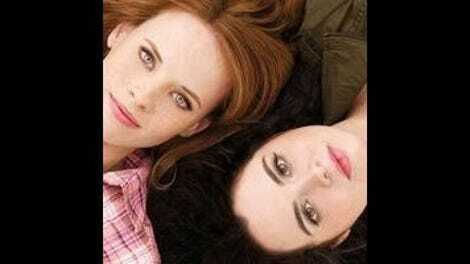 But Switched At Birth is like life itself: Life goes on, as does the plot of the show. Carrie Wikis Some Art: Girl With Death Mask (She Plays Alone), Frida Kahlo, 1938, oil on metal. Kickass. Seriously, Daphne did cocaine. It was a bit much. I like Toby’s new neighbor Lily. She’s got moxy. There really is no reason for Tank to be on the show anymore, or to have to interact with Emmett. But if it had to happen, the way it played out here was fairly satisfying. Toby and Tank as roommates is also completely unnecessary but has the potential to be fun, at least. Regina remains the wild card in this whole Angelo-grief storyline. She’s obviously not doing well, but it’s still simmering in the background for now while the show focuses on Daphne’s downward spiral instead. An episode that begins with a sun-dappled fantasy of the joy of Stef and Lena’s impending motherhood is destined to end in sadness. These are the rules of television, and The Fosters follows them down to the very letter, lulling the audience into a false sense of submission for 45 minutes before dropping the promised bomb in the last 15. Structurally, this episode is completely disappointing. Emotionally, however, it totally delivers. It seems like the cruelest thing in the world for The Fosters to concentrate so much on Lena’s desire to have a biological child of her own and then shatter her dreams. It might actually be the cruelest thing in the world, if the show wasn’t so careful to at least give Lena something to take away from the tragedy of having to terminate her pregnancy to save her own life. All along, Lena’s desire to have a child was about more than wanting her own biological children; it was a way to give her an absolute, unshakeable connection with someone else in the family, one that was forged by blood rather than choice. One that couldn’t be thrown away, no matter what. What Lena gains from this loss is the reinforcement that family is a choice you make to love someone, day after day, blood or no blood. And no matter her doubts about being a biological outsider in the Foster family, her mother points out that her family loves her and chooses her, over and over again, every day, and she does the same in turn. But all of this emotion was crammed into the final 15 minutes of the episode, leaving the rest to bounce around between Jesus’ bizarre Craigslist quest to sell Stef and Lena’s bed, Brandon’s continued attempts to keep the truth about sleeping with Dani from his parents, and Callie’s realization that she is still dealing with the emotional aftermath of being raped by Liam. It seemed as if the strange bed storyline was the show’s attempt to do a light, funny episode that takes a sudden, unexpectedly serious turn in its latter half. This is a highly effective story structure when deployed properly, but the happy opening dream sequence followed by Lena’s sudden high blood pressure tipped the resolution’s hand too much, making the bed story feel more jarring and just plain silly than anything else. I was fine until Stef told the kids. Then I was a mess. The one part of Lena’s storyline that didn’t work for me is the child giving her a stuffed animal named Frankie to keep her company in the hospital. A bit too emotionally pat for my tastes. Callie and Jude’s scenes are fully and completely wonderful. Christian from Dance Academy asked Mariana out! Maybe her storyline this season will get better now? Mike is helping Ana get sober, which sets up very interesting story possibilities for the future. “I already helped. I got out of your way.” OK BRANDON. SURE.